Gerry Patterson, who rode the Paris-Roubaix route for Freewheeling France, has these tips for surviving the world's toughest one-day race. 1. All the sections of Paris-Roubaix are public roads (mostly used by farmers) and you can go ride them anytime you want. The Arenberg Trench is closed to motor traffic, but you are still welcome on it if you are riding a bike. The route changes very slightly each year, so check the ASO site for the current route map. 2. If you go independently from the UK, Lille – with its Eurostar terminal – is a good starting point. 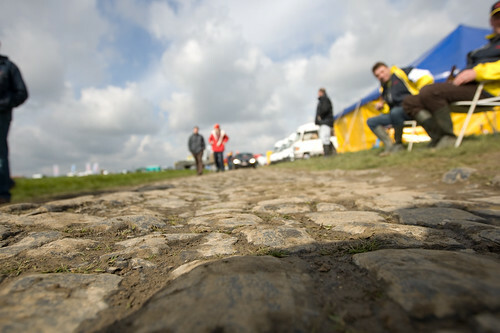 like Pavé Cycling Classics, will have specially kitted-out bikes for the cobbles. 4. If you bring your bike, double up on handlebar tape and even consider extra insoles in your shoes. Wrists and feet are two major receivers of shock. 5. Come prepared for any type of weather. My weekend was gloriously warm and sunny for early April, but it can be really foul in this area of the world. Dress for the worst. 6. Once on the cobbles, ride hard, preferably in the biggest gear you can grind. You get a more stable ride in a big gear. 7. Keep pedalling. Once you stop it’s very hard to get going again. 8. Hold your hands where you want. For me, on the tops (but not the hoods) was the best. Wherever you hold them, do so lightly, with lots of flex in your arms. If you stiffen up the shock will be much worse and your fingers could get frozen to the handlebars! 9. If you’d like to race Paris-Roubaix there is a sportive every two years, plus the ASO has one that had its inaugural year in 2011 and may or may not be an annual event. 10. Plan for some luxury after your ride. You’ll deserve it! 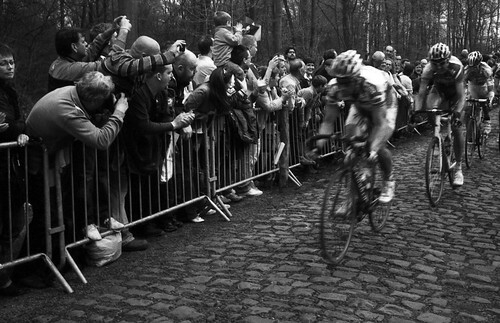 Riders in the 2009 Paris-Roubaix enter the feared Arenberg Forest. A Sunday in Hell, is a documentary by Jorgen Leth that follows the 1976 Paris-Roubaix. Featuring Merckx, De Vlaeminck, Martens and Moser, it is regarded as a masterpiece, possibly best cycling film ever made. Road to Roubaix, a film by David Deal and Dave Cooper, is a more modern take on the race, and also worth a look. Paris-Roubaix: A Journey Through Hell by Phillippe Bouvet, Pierre Callewaert, Jean-Luc Gatellier and Serge Laget, a quartet of France's leading cycling writers, offers stunning coverage – in both words and pictures – of the race. There's also The Spring Classics: Cycling's Greatest One-day Races by the same authors, which features Paris-Roubaix as well as Milan-San Remo, Ghent-Wevelgem, the Tour of Flanders, the Amstel Gold Race, La Fleche Wallone, and Liege-Bastogne-Liege. See also William Fotheringham's A Century of Cycling: The Classic Races and Legendary Champions. Fotheringham, who writes about cycling for the Guardian newspaper, is also the author of Put Me Back On My Bike, the acclaimed biography of Tom Simpson, Fallen Angel: The Passion of Fausto Coppi, and Roule Britannia: A History of Britons in the Tour de France. Most recently, he has written Cyclopedia: It's All About the Bike. If you're planning on tackling the route yourself, see IGN's Lille-Roubaix-Tourcoing map. Michelin has a Northern France map and a Northern France and the Paris Region guide. There's also Bradt's Cross-Channel France: Nord-Pas de Calais – The Land Beyond the Ports by John Ruler, which includes a tourist overview of the town of town of Roubaix. Gerry Patterson lives in Nîmes with his wife, Shoko. When not updating his cycling blog and adding routes to his website, he can be seen – you guessed it – cycling around Languedoc-Roussillon, searching out new and interesting rides. See also Gerry's guide to themed rides in Languedoc-Roussillon, and his guides to Montpellier, Perpignan, Nîmes and Narbonne.